Songes is one of Annick Goutal’s widely popular and beloved fragrances. Every time I visit a particular perfume store where I live, and spot the Songes factice there I think to myself, “I really have to smell that sometime”. Then inexplicably, I put it off. But I’ve wrangled myself, got my act together, and finally tried her out. In Bottle: Sweet fragipani with an undercurrent of jasmine powdery ylang ylang and a vanilla base. A rather interesting mix and quite sweet to boot. Applied: Very sweet opening consisting mostly of fragipani and tiare. Both of these flowers having an inherent sweetness attributed to them. They make Songes come off as a bit too girly and sweet but if you wait her out a little the sweetness gets tamer though it never really goes away. But you get a mild powdery note that comes out in the mid-stage along with a gorgeous jasmine mingled with a vanilla base. Wait a while longer and Songes evolves into its end stage with a soft powdered vanilla scent. There’s something very pretty about Songes’ midstage and base, I can probably do without its very sweet opening but the opening gives way to a much better fragrance so in this case, I can deal with the opening because it’s honestly not that bad, so long as I can get to the middle and base. Extra: Songes was created in 2005 by Isabelle Doyen. Doyen was behind other fragrances such as Annick Goutal’s Mandragore, Un Matin d’Orage, and Le Mimosa. Design: Songes, like many Annick Goutal fragrances come bottled in a variety of ways. The most popular you’d see is the feminine ribbed glass flacon with the paper identifier and the ribbon tied around the bottle’s neck. If you wanted to pay a bit more for a premium design, you can get the beautiful round flacon with the adorable crescent moon cap. Notes: Frangipani, tiare flower, jasmine, ylang-ylang, vanilla. If nothing else, Songes is a competent fragrance that would be good for someone who enjoys sweet vanilla florals. And if you happen to be a lover of perfume bottles, the full-on round flacon would make a beautiful piece. 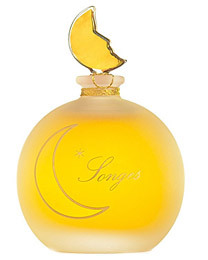 Reviewed in This Post: Songes, 2009, Eau de Toilette. This entry was posted in annick goutal, floral, oriental, Reviews By House, sweet and tagged frangipani, jasmine, tiare flower, vanilla, ylang-ylang. Bookmark the permalink. I really disliked this the first time I smelled it. And the second. Then I tossed it in my samples box and tried to pretend it didn’t exist.